Precision Color is your premier Wide and Super-wide digital format printer. 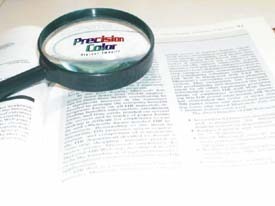 Located in Las Vegas, Precision Color is a full-service printing company, serving a wide variety of advertising, commercial and corporate clients. And, we are your one-stop resource for all your visual marketing needs. Working with the industry’s most qualified and experienced staff, and state-of-the-art equipment, we can provide you with the right solution for all your company’s needs. Our resources offer a broad range of design, wide and super-wide printing, both photographic and vinyl, laminating, mounting and fulfillment services. What differentiates Precision Color from other digital printing companies? To continuously make improvements and by staying in tune with today's technology will enable us to anticipate, understand, and fulfill customer expectations so that the company becomes the premier supplier of each of our customers.